TON 792 as it is today still with its correct black hard top, but now it`s all red. UOC 741 was different from the other cars. Firstly it was a BN4 whereas the others were BN6s. Secondly It was an old 1956 press demonstrator car that had received the 6 port head and other modifications including 4 wheel disc brakes and a blue printed engine, when it ran in the 1957 Mille Miglia. PMO 202 - displaying the features mentioned above - and a Coupe des Alpes! In the team picture its colour appears to be BRG, although the duo tone feature is hidden. BRG was not a factory colour for 100-Sixs so this was unlikley. In the picture above it appears to be blue - somewhat like the BN3. Note the relatively stock interior. Some rally aids, a couple of extra switches but not much else. 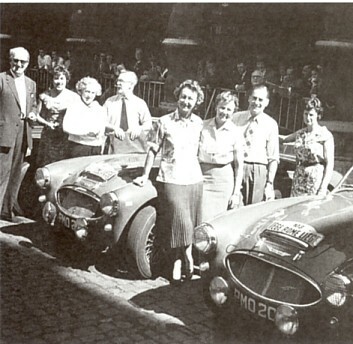 The first BMC team entry of Austin Healeys was put together for the 1958 Apine Rally and was managed by Marcus Chambers. 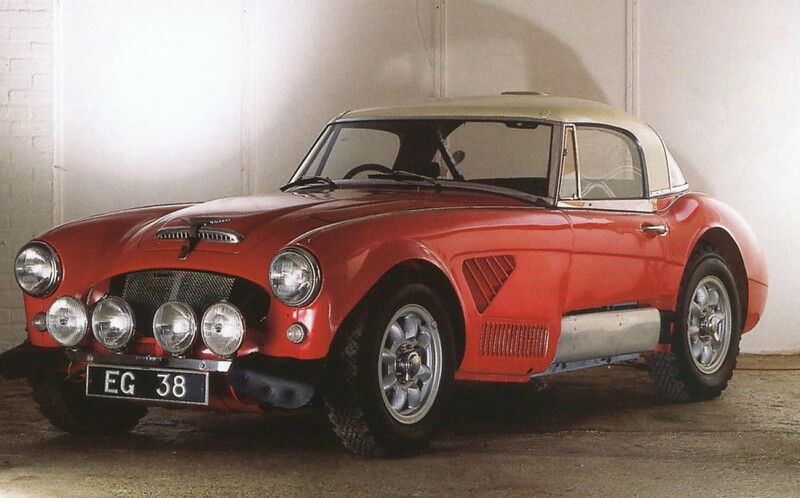 When people think of a Works Healey they probably think of a car like the one below. This car however was the end of the line of the development of the Works cars and has many more modifications than the original 100-Sixs. The car below was in fact prepared for Timo Makinen to drive in the 1967 RAC Rally. Works Healeys had not been run for two years and the car actually belonged to Peter Browning at the time. Makinen then changed his mind and Rauno Aaltonen agreed to drive it. In fact it never ran as the rally was cancelled due to an outbreak of foot and mouth desease. 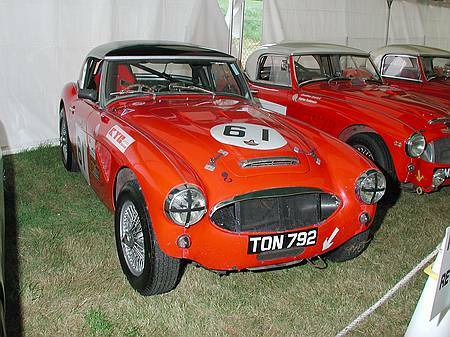 The car is the ultimate devlopment of the Works Healey and was fitted with an all aluminium engine (not just the head!) It was capable of 0 -60 mph in 7.5 seconds and a 140 mph. TON 792 was the BMC demonstrator and was usually used by the Vice Chairman George Harriman. He agreed to lend it to Marcus Chambers to make up the five car team for the 1958 Alpine Rally. 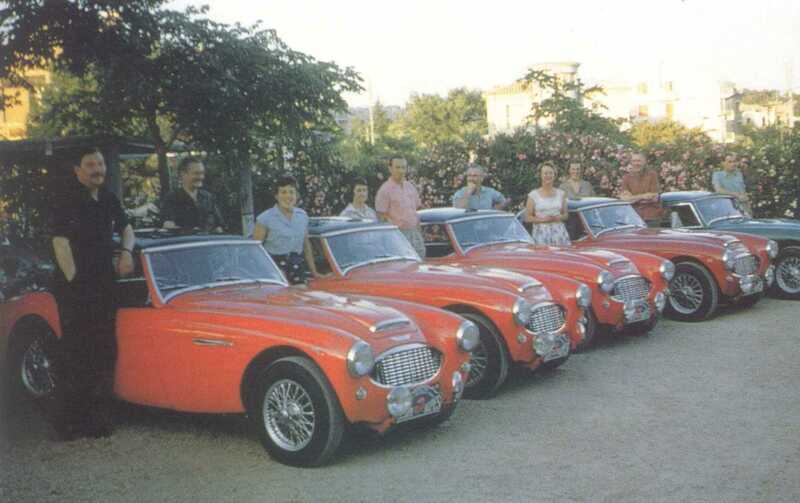 Chambers` original plan was to run 5 MGA Twin - Cams. At the June 2009 AHCOA Conclave in Ontario, Canada, Rich Chrysler spoke with guest of honour Ann Wisdom who partnered her father in the very first rally event for UOC. She confirmed that the car was Pacific Green over Florida Green, and had the `grey` interior and dark green carpets of a standard production model. Ann also mentioned that their knickname for the car, playing on its UOC registration plate, was `You Old Clot`. A friendly criticism of the car based on its original rally outing when it was a stock press demonstrator still carrying the two-port head. 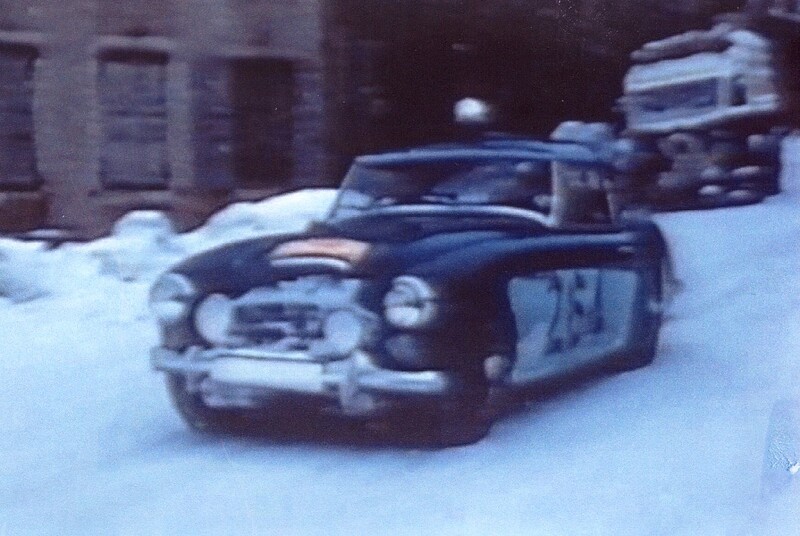 John Gott and UOC in the Alpine Rally. The 100-Six specs were much closer to the production model than the car above. They also differ from the later 3000s in several aspects as the Works cars continued to evolve from 1958 through to 1965. Even the 100-Six cars evolved during their brief career from 1958 to 1959. - The three PMO cars were new cars and were painted Signal Red. - Two air vents in the bonnet facing backwards either side of the bonnet ridge. - 100-Six grill with two small sections cut away asymetrically on either side. on the class they were competing in. 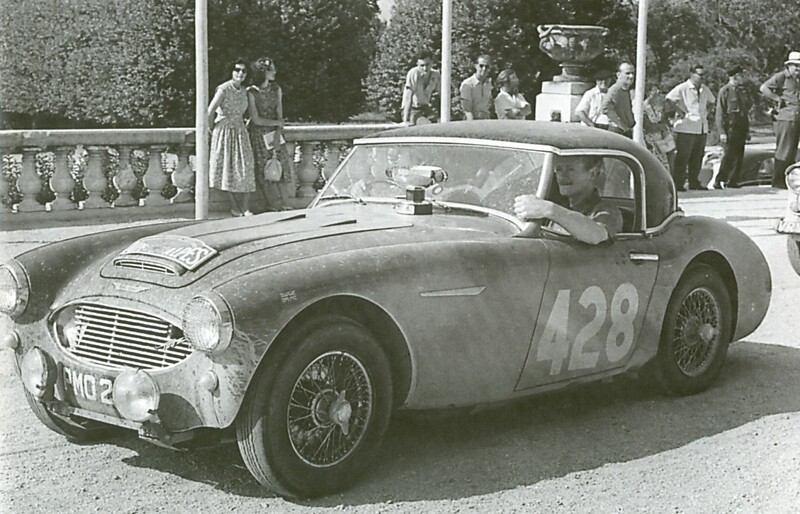 UOC 741 as prepared for the 1958 Monte Carlo rally, including swivelling roof light.